Let us start with a quick review. Thanks ytbmp3.com for not having popups, but then the replacement of those are the nasty looking ads to the right and to the left of main website functional area… those ads sometimes can get nasty too, so watch out.. Otherwise it was a quick conversion, as you see below – only 3 steps with my screenshots, very fast and efficient. almost as good as theyoump3 or savetomp3 which is a very good achievement. But yet there are too many ads on the sides… 4 stars, cannot go any higher… Although i did enjoy using this site, despite the ads..
today we’re going to download Luis Fonsi, Demi Lovato – Échame La Culpa – check out what music that is.. something popular from youtube..
let’s open front page and check it out.. here’s how it looks now in november 2017.
at this point all you need to do is select bitrate (that is if you want to adjust it, just remember, saving youtube audio as anything more than 140kbps is wasteful, audio is never better than 128kbps really) and start and end time, if you want to cut the mp3 shorter for ringtone or something, and go ahead click blue download button. 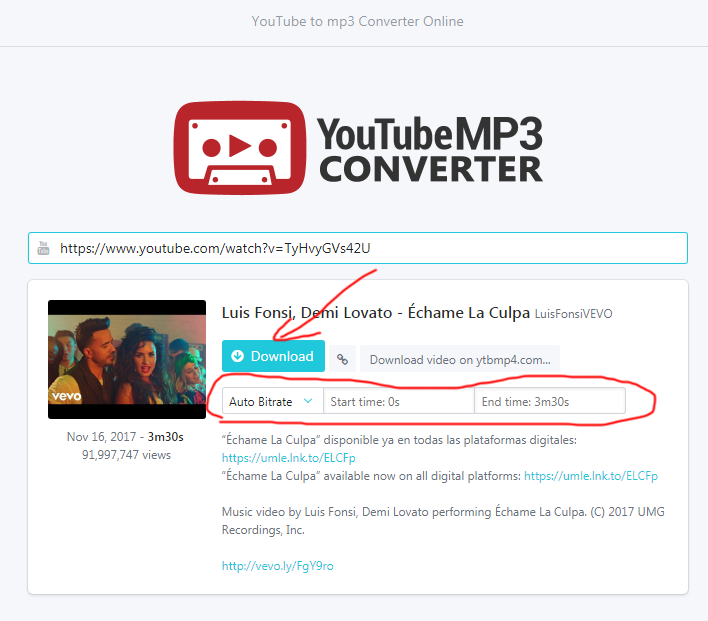 now lay back and relax, while browser takes 2-3 seconds to download the mp3. good job! !